A consortium of organisations in NZ commissioned PWC to study The Value of Design to New Zealand’s Economy, putting numbers on the contribution in dollar figures, in a similar way to the UK Design Council’s Value of Design work a few years back. That’s the dollar value coming out… but what about the spending going in, and how does this relate to these outcomes? PWC sliced their data to reveal a reality very different to the double diamond. They ran a headcount of employees engaged in the four stages. It’s a map of how we invest in ‘design’. This pattern reads alike to what I’ve experienced in other countries. I imagine the bottom line impact isn’t the only thing that’s similar in UK – that they, and other nations, have an arrow hiding behind their diamonds too. So, what can we read from this? 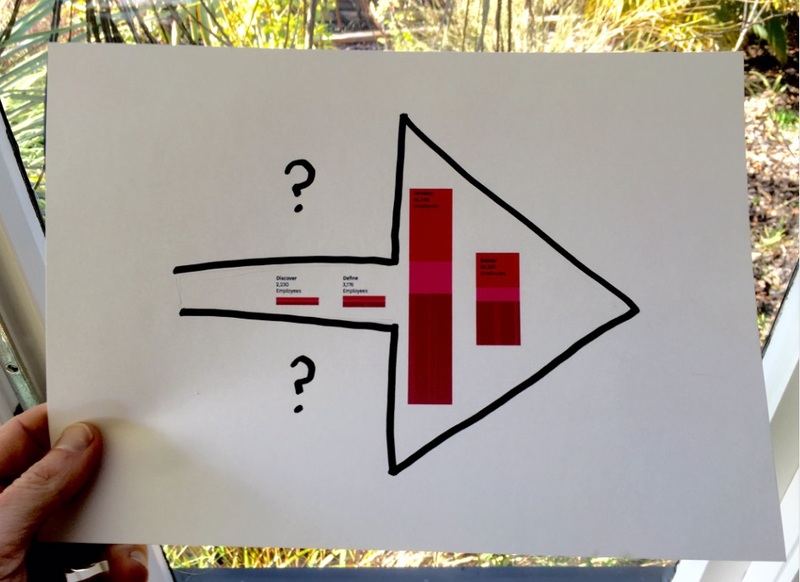 Design research is struggling to find a place in the strategic toolbox? Designers aren’t able to convince their clients to invest in research upfront? Design research is unable to demonstrate it’s value/contribution? Decision makers are afraid to challenge their own assumptions? We’re better at ‘making the product right, than making the right product’? See ambiguity and uncertain returns (and therefore risk) in investing in the first diamond? …and I’m sure you could double both of those lists in a snap. So, while the proliferation of design thinking, programmes like Better by Design and Callaghan have provoked many businesses to reduce the distance between their own and their customers’ worlds, the (still) almost vacant first diamond reveals a huge under-investment, and suggests a corresponding opportunity for NZ brands to front-load development with investment in customer insights. Time to convert dollars into diamonds. Kudos to DesignCo and all the organisations who co-funded this report. I – for one –am looking forward to seeing some of the initiatives suggested in this paper play out. And to meet the 2,000 (and change) of you I’m yet to. Although I heartily agree with your conclusions, I’d just like to say that the PWC’s graph isn’t necessarily the best diagram to make your point; For example, when you want to construct a building you only need a few architects, but thousands of construction workers. Therefore there will always be more people in production than design as it requires more people to take a concept on paper and build it in concrete. The same can be true for digital products, you probably need more developers than researchers. Ideally, the same people that are going to build the product need to have been immersed in the research from the start. However, that isn’t always possible. I agree that not enough importance is given to the role of design and research, but I don’t think the employee-metric illustrates that point. A contributing factor may also be that Kiwis often consider themselves ‘wizards of wing-it’ and like to think we are good at operating an an intuitive, shoot from the lip manner, unfettered by (apparently) unnecessary process. A number of factors may contribute to this. We are very small – probably stretching for even two degrees of separation and so it appears easier for us to analyse an issue and leap to a solution – where a larger societal/economic/technical/etc base might require a higher degree f introspection, research and analysis. Two little green dots in the middle of a very large blue mass, rather isolated from the troubles and stresses that confront other nations, we are rarely really challenged: for the most part, our tough issues are discretionary: we face few, if any challenges, for survival and thus are less motivated or driven to truly pull apart and analyse any given issue. When was the last time that New Zealand was truly challenged (RWC notwithstanding!)? When the EEC dumped our lamb..? The early 70s oil crisis..? Great share, Nick. And completely agree with the comment “wish they were involved earlier in the process — designers are typically not now”. I think in government we need to spend much more time in the “Discover” so that we truly understand what the problem is we are trying to solve. I agree with Simon – our organisation has about 10 UX staff but over 600 developers and testers. It is quick and easy to build and test prototypes as compared to software – that is the value of prototyping, after all. But I’d like to know if the other roles that contribute to design are included in either the metrics or your mental model. In our organisation (and we’re not alone), the process of discovery isn’t solely owned or performed by UX – it is initiated with Product Management, and supported heavily by SMEs and BAs – we typically have at least 1 of each roles for each UX person involved in a project. 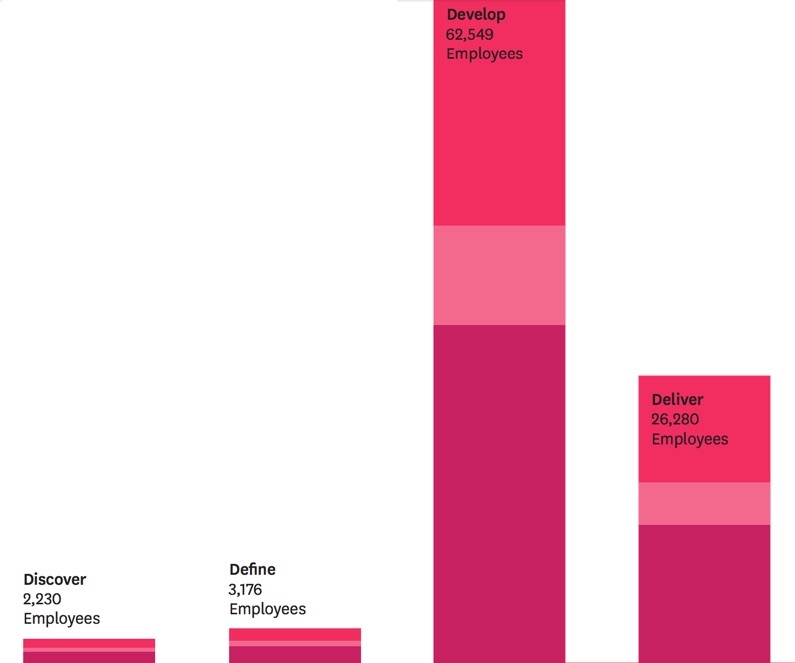 Are these roles counted in your ‘Discovery’ numbers?